The latest research shows that sitting may be more harmful to your health than smoking. Luckily, getting up off the couch and going for a walk can put you well on your way to preventing everything from heart disease and diabetes to high blood pressure, depression, memory problems, and more. Although you’ve likely been walking since you were about one year old, there are specific techniques that can help you avoid injuries, make walking more enjoyable, and increase the health benefits of walking. Stand tall. Leaning forward or hunching over makes it more difficult to breathe and can cause backaches. To avoid this problem, extend your spine as if you were being lifted from the crown of your head. Place your thumbs on your lower ribs and your fingertips on your hips. As you stand tall, notice how the distance between your fingers increases. Look up. Looking at your feet puts unnecessary stress on your upper back and neck. Bring your gaze out about 10 to 20 feet in front of you. You’ll still be able to see ahead and you’ll prevent upper-body tension. 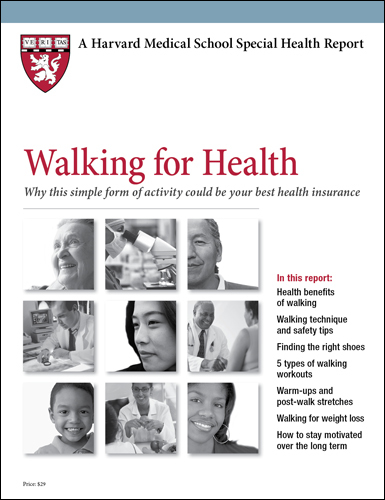 For more ways to prevent injuries, see page 16 of Walking for Health.